WAIST HIGH: Ali Campbell Leaves UB40. UB40 has confirmed that they have parted company with lead singer Ali Campbell after thirty years. A spokesman for the group said Campbell wishes to focus more time on his solo career. The singer's final performances with the band will be in Australia, New Zealand and Uganda in February. Campbell embarked upon a solo album project last year and found that his time and commitment to UB40 began to conflict with his own recording work, promotional commitments and corporate shows. 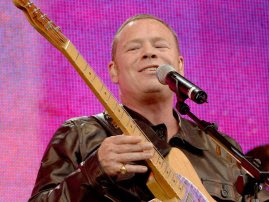 The spokesman said: "Ali Campbell has taken the decision to focus on his solo career and in doing so, could not give his full commitment to UB40. The other band members of UB40 are naturally disappointed and saddened after being together as a band unit and as good friends and a 'family unit' for almost thirty years." He added "UB40 will continue to record and perform with the existing seven members. UB40 has never been about any one individual, but more a collective of band members, who have all contributed to create the unique sound that UB40 have become renowned for over the last three decades." A decision on replacing Campbell has not yet been made by the other seven band members, all of whom hail from Birmingham. The band's next album 24/7 which was recorded with Campbell will go ahead as planned for release in May this year on the band's own REFLEX MUSIC record label. The spokesman added: "The band are of course saddened by Ali's departure, they have been together for a long time and their relationship as band members and friends is almost like a marriage, having lived in and out of each others pockets for pretty much most of their lives." Formed in 1978, UB40 have sold in excess of 70 million records and notched up 51 hit singles.